The Pipedrive integration makes it easy to manage all your Personas straight from the LiveChat application. It will help to close more deals and boost your profits. Pipedrive is a CRM software and a reliable sales management tool. It allows you to map out each step of your sales process. Thanks to a simple drag-and-drop builder, you can easily complete every stage. The solution supports lead management. It enables you to gather contacts through Web Forms that can be placed on your newsletter or website. What's more, Pipedrive lets you collaborate with your teammates using notes, reminders, and goals. It integrates with many other apps, including Google solutions, which you can use to broaden its functionalities. Apart from that, the tool comes with mobile optimization, advanced customization, statistics and reporting, multi-language and multi-currency, and the API. With LiveChat for Pipedrive we went all in, building the integration that seamlessly blends into your LiveChat application. Now you can manage all of the integration's features right at your fingertips. The integrations allows you to add new contacts to Pipedrive from ongoing or archived chats. There's no need to switch between the apps, so you can easily save some additional time and dedicate it to your customers. And what's a better way to increase your conversion rates than doing just that? If a customer chatting with you is already in your Pipedrive, you can view his details straight from the chat, without leaving the LiveChat app. You can add a chat transcript to your Person, straight from concurrent or archived chats with a few simple clicks. You can add a chat transcript to your Deals, straight from concurrent or archived chats with just a simple click. Capture leads on a big scale and strengthens relationships through live chats. Competitive advantage can be obtained by managing your products more efficiently and having good relationships with customers. With LiveChat, you can communicate with your customers in a channel they prefer while providing a superior customer experience. Relevant CRM information such as a company name, the last order and a phone number is displayed directly in the chat window so that you can offer more personalized, informed service from the start. 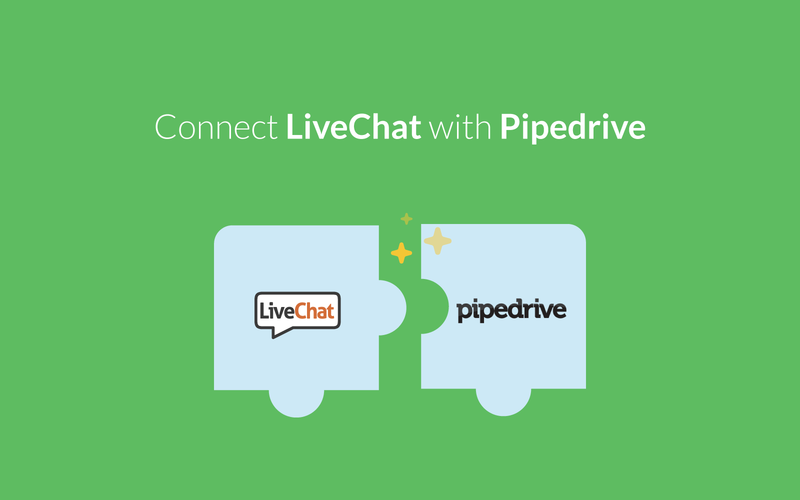 Start using LiveChat with Pipedrive now!